Michael Frayn understands the conventions of stage farce better than most. His award-winning 1982 Noises Off has been performed many times on both sides of the Atlantic and is currently running at the Novello in London, having transferred from the Old Vic. In both his plays and his novels he often uses humour to raise and explore philosophical questions. 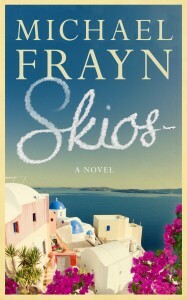 His new novel Skios is no exception. 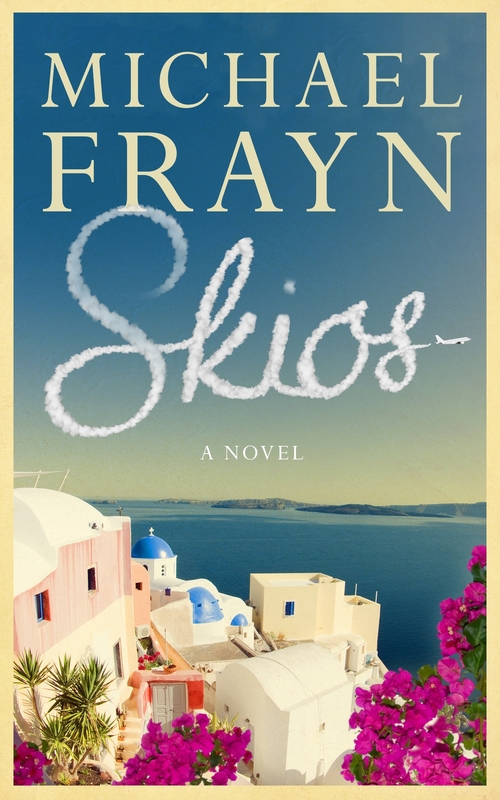 The format is classic: Frayn assembles a cast of strongly delineated characters, each with a dominant characteristic, and places them in a claustrophobic setting (a Greek island) that is not too claustrophobic (it’s big enough to get lost in). The central character, Nikki Hook, a coolly efficient blonde in her thirties, is currently working as the PA to Mrs Fred Toppler, but with ambitions to be the next Director of the Fred Toppler Foundation, an organization founded to ‘promote civilized values.’ Her desire drives her choices and a series of misunderstandings gives momentum to the plot, which becomes increasingly complex and which powers relentlessly towards a grand climax. So far so farcey, but this is a novel and Frayn is able to throw off some of the restrictions that theatre would impose. There is a far greater cast of characters than any stage could accommodate, or any theatre could afford. Although they are quite simply drawn, each one’s thoughts and emotions are fully explored so that we see them from the inside via the authorial voice. Nikki is the central character, but she is not the author of her own downfall, in fact she does very little and events unroll around her. Following the conventions of the broadest farces, most of the comedy comes from the misunderstandings, which are both cultural (since people of many nationalities have arrived on the island to hear the Fred Toppler Lecture) and sexual. Thus the name Oliver Fox sounds quite unrecognizable when pronounced by the Greek taxi driver who’s been sent to meet him (‘Phoksoliva?’) and becomes sexual on the lips of a Russian woman who thinks that No is the English word for Yes (‘No phoks!’). The novel form gives Frayn more room to expand the comedy in other directions, and one sly in-joke has the Foundation’s writer-in-residence placed at the very edge of the action, dreamily unaware of the chaos that is developing around him while struggling with the next stanza of an entirely pointless poem. The plot builds steadily towards the climax, which we know from early on will be the delivery, or possibly non-delivery, of the Fred Toppler Lecture. Farce structure dictates there should be a series of increasingly challenging obstacles preventing the protagonist achieving his or her goal, until a major crisis intervenes about three-quarters of the way in, followed by a headlong rush to the finale. Frayn hits the three-quarter mark almost exactly. The lecture is about to be delivered by an imposter, the real lecturer is, apparently, about to step forward and unmask the fraud, the rest of the cast are all assembled with their various sub-plots approaching crisis point. The imposter stands up, takes a breath and… Frayn exercises the novelist’s prerogative and embarks on a lengthy and serious digression. To say more would constitute a spoiler, but eventually he returns the reader to the moment just before the lecture starts.